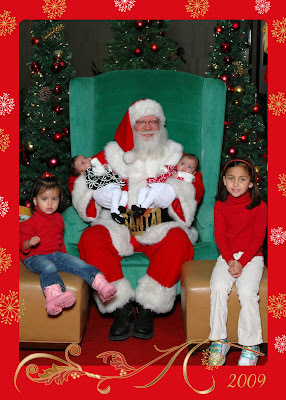 Taking 4 small children to see Santa is serious business. I had to call for reinforcement (thanks dad). But it was totally worth it. This is the first year that Bella has really gotten into Santa. She's been asking all sorts of questions that I have no idea how to answer. Like, is it Santa at the mall or one of his helpers? How can he watch everyone? What's it like on the North Pole? Do other people live there? It's so fun to watch her as she thinks about everything and gets so excited. Of course I want her to remember what's most important about Christmas, but watching her eyes light up as she thinks about Santa is so fun!! Such a cute picture. Love the questions too. My boys are really into the whole Christmas thing this year too. It makes it fun! Love the pic. Santa's belt buckle rules! The girls all look adorable. Sally used to threaten to call Santa if we were being bad. I totally remember believing that and straightening right up. That photo is SOOO cute!!! Bella's questions are too cute, too! It does make it fun when they get old enough to really understand!! Wyatt is the same way this year! I LOVE IT!! My kids would always asked how I knew Santa's number. I told them it was stamped on the new baby's bottom and I had to memorize it before it disappeared. Seriously such a cute picture. I love that not only are the twins dressed alike (although different colors), but Bella and Claire are matching too! GASP! You should hang this picture up in your home EVERY Christmas from now on. I love it! The most important thing? You mean presents? Oh Yeah! Bev, for the record, Bella dressed herself and Claire. She tried to get me to do it, but I had to put my foot down on dressing the same as my kids. wow, you are amazing. we were at the mall for about 30 min on saturday and left cuz it was crazy!! good job for getting them to santa. I can imagine it's important to the older kids:) how fun to have bella getting into it more and more!